Digital Heaven releases Final Print – new application prints markers from Final Cut Pro sequences. 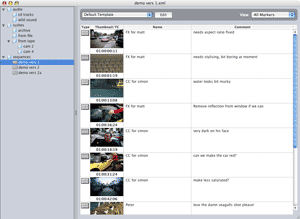 announced the release of Final Print, a companion application to Final Cut Pro. Final Print provides a useful workflow enhancement when handing off a project to other members of the post production team. Notes of shots to be worked on are made directly in Final Cut Pro as markers and exported to an XML file. Final Print opens the XML and displays a list of clip and sequence markers along with name, comment, timecode and thumbnail image. The list can be printed or saved as a PDF file. Column layouts can be customised and saved as a template for recall at a later date. In addition, the colour of the printed header can be changed and a company or production logo shown at the top of every page. Digital Heaven was founded in 2000 by ex-BBC Resources editor Martin Baker. For six years the company provided broadcast post production facilities for clients such as the BBC, Channel Four and many independent production companies. In Summer 2003 Digital Heaven became the first London facility to make the switch from Avid editing systems to Apple’s Final Cut Pro and later that year, the first software product, EDL Mirror was released. Since then 14 Final Cut Plug-ins and Multicam Lite, the first multicamera editing solution for Final Cut Pro have been added to the product range. VideoSpace, a free widget for Mac OS X Tiger which calculates the disk space required for a given duration and codec setting was released in October 2005. Clocking up over 10,000 downloads in the first month of release, VideoSpace was featured as a macworld.com ‘Widget of the Week’ and as a staff favourite on Apple’s widget download page. In November 2005, MovieLogger for Mac OS X, an easy to use QuickTime logging application was released followed in March 2006 by AutoMotion, a revolutionary tool for creating multiple versions of motion graphics. The latest new release is Final Print, a workflow enhancement for printing markers from Final Cut Pro sequences.